Some risk factors for breast cancer are things you cannot change, such as being a woman, getting older, and having certain gene changes. These make your risk of breast cancer higher. Simply being a woman is the main risk factor for breast cancer. Men can get breast cancer, too, but this disease is about 100 times more common in women than in men. As you get older, your risk of breast cancer goes up. Most breast cancers are found in women age 55 and older. About 5% to 10% of breast cancer cases are thought to be hereditary, meaning that they result directly from gene defects (called mutations) passed on from a parent. Women with one of these mutations are more likely to be diagnosed with breast cancer at a younger age, as well as to have cancer in both breasts. They also have a higher risk of developing some other cancers, mainly ovarian cancer. In the United States, BRCA mutations are more common in Jewish people of Ashkenazi (Eastern Europe) origin than in other racial and ethnic groups, but anyone can have them. Changes in other genes: Other gene mutations can also lead to inherited breast cancers. These gene mutations are much less common, and most of them do not increase the risk of breast cancer as much as the BRCA genes. ATM: The ATM gene normally helps repair damaged DNA (or helps kill the cell if the damaged can’t be fixed). Inheriting 2 abnormal copies of this gene causes the disease ataxia-telangiectasia. Inheriting one abnormal copy of this gene has been linked to a high rate of breast cancer in some families. TP53: The TP53 gene gives instructions for making a protein called p53 that helps stop the growth of abnormal cells. Inherited mutations of this gene cause Li-Fraumeni syndrome. 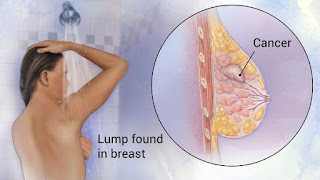 People with this syndrome have an increased risk of breast cancer, as well as some other cancers such as leukemia, brain tumors, and sarcomas (cancers of bones or connective tissue). This mutation is a rare cause of breast cancer. CHEK2: The CHEK2 gene is another gene that normally helps with DNA repair. A CHEK2 mutation can increase breast cancer risk about 2-fold. PTEN: The PTEN gene normally helps regulate cell growth. Inherited mutations in this gene can cause Cowden syndrome, a rare disorder that puts people at higher risk for both non-cancer and cancer tumors in the breasts, as well as growths in the digestive tract, thyroid, uterus, and ovaries. CDH1: Inherited mutations in this gene cause hereditary diffuse gastric cancer, a syndrome in which people develop a rare type of stomach cancer. Women with mutations in this gene also have an increased risk of invasive lobular breast cancer. STK11: Defects in this gene can lead to Peutz-Jeghers syndrome. People affected with this disorder have pigmented spots on their lips and in their mouths, polyps (abnormal growths) in the urinary and digestive tracts, and a higher risk of many types of cancer, including breast cancer. PALB2: The PALB2 gene makes a protein that interacts with the protein made by the BRCA2 gene. Mutations in this gene can lead to a higher risk of breast cancer. Mutations in several other genes have also been linked to breast cancer, but these account for only a small number of cases. Genetic testing: Genetic testing can be done to look for mutations in the BRCA1 and BRCA2 genes (or less commonly in other genes such as PTEN or TP53). While testing can be helpful in some cases, not every woman needs to be tested, and the pros and cons need to be considered carefully. If you’re thinking about genetic testing, it’s strongly recommended that you first talk to a genetic counselor, nurse, or doctor who can explain these tests. It’s very important to understand what genetic testing can and can’t tell you, and to carefully weigh the benefits and risks of genetic testing before these tests are done. Testing costs a lot and might not be covered by some health insurance plans. Our section on genetics and cancer has more information about genetic mutations and testing for them. A woman with cancer in one breast has a higher risk of developing a new cancer in the other breast or in another part of the same breast. (This is different from a recurrence or return of the first cancer.) Although this risk is low overall, it’s even higher for younger women with breast cancer. Overall, white women are slightly more likely to develop breast cancer than African-American women. But in women under age 45, breast cancer is more common in African-American women. African-American women are also more likely to die from breast cancer at any age. Asian, Hispanic, and Native American women have a lower risk of developing and dying from breast cancer. Breasts are made up of fatty tissue, fibrous tissue, and glandular tissue. Someone is said to have dense breasts (on a mammogram) when they have more glandular and fibrous tissue and less fatty tissue. Women with dense breasts on mammogram have a risk of breast cancer that is about 1.5 to 2 times that of women with average breast density. Unfortunately, dense breast tissue can also make it harder to see cancers on mammograms. A number of factors can affect breast density, such as age, menopausal status, the use of certain drugs (including menopausal hormone therapy), pregnancy, and genetics. How serious is Hepatitis B and C?